The 2nd annual Jalopnik Film Festival was in full swing last night at Brooklyn's Nitehawk Cinemas. The theaters were aglow with inspiring automotive visuals accompanied by the sound of raw horsepower, but the show didn't end there. Here are the awesome cars that were parked outside. 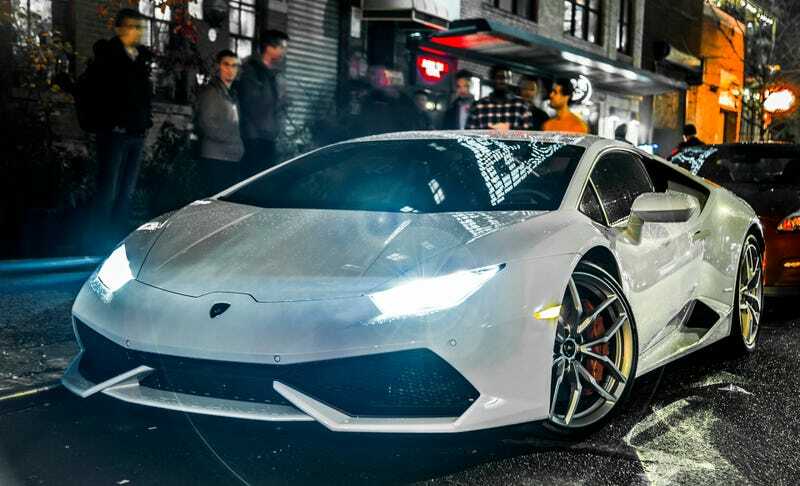 The 2015 Lamborghini Huracán is somewhat of an enigma, as it's one of the hardest cars to truly appreciate in photos. Its sleek lines and sharp angles all but screw up the perspective on any photo, but when you can see it in the flesh, (or is it carbon? ), the car looks un-freaking-believable from any angle. The rep from Lamborghini was kind enough to start the car and throw a few revs into the brisk night air, potentially scarring for life the kids who were directly behind its four comically large exhaust ports. Or converting them to car people forever. It's usually one or the other. The fighter-jet interior of the car looked, by any stretch of the imagination, nice. I didn't play with any of the gadgets or even sit inside, for fear that it had an auto-eject function for anyone who didn't have a seven-figure income. This is a car that happens when form and function aren't just good bedfellows, they're one and the same. I hope to have a closer look with this Italian powerhouse later on, if the benevolent and forward-thinking genuises at Lamborghini decide to give the Jalopnik staff unrestricted access. Another ridiculously striking car was the Morgan 3-wheeler, owned and piloted by former transcontinental record holder Alex Roy. It isn't so much a car as it is an automotive storytelling machine. Every experience is different, and you will never find a Morgan owner without at least a few crazy stories to tell. The car was designed in the early 1900s by English craftsmen and built quite literally in a shed. To see one represented on a modern New York street, especially by someone that drives the car daily is akin to seeing a unicorn being struck by lightning, while holding a winning lottery ticket. When started, the car emanates a pungent aroma of fiberglass, oil and steam. It's positively intoxicating. Accompanying this striking group of automotive masterpieces was the Ignition hero car - a Volvo P1800S from the Festival's VIP event at Classic Car Club Manhattan, Raphael Orlove's lovable Baja Bug, and a Volvo C303 camouflage truck, as well as a few really cool reader rides. If anyone wants to share their pics from the day, post them in the comments! This is the craziest Lexus SC300 I&apos;ve ever seen. And it&apos;s mine.